--Currently Matanzas Creek Winery has four Sauvignon Blancs (Sonoma County, Bennet Valley, Helena Bench, and the proprietary-named "Journey") and Monahan is working on a fifth raised in concrete eggs that were constructed in Petaluma. --For the cooler Bennett Valley site, two French clones are used: one to give more green basil aromatics, the other more lychee/guava. --She likes using large, wooden vats (foudre) for Sauvignon Blanc as they keep the lees moving around, adding texture. --The warmer Helena Bench vineyard has a canopy trained like a lyre to protect the grapes from the sun. The presence of Musque clones give flower notes to the wine from this site. 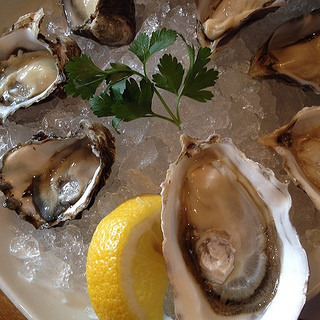 --When it comes to an oyster, you are not limited to wines that are "hammering it with acid". Some of the richer, rounder Sauvingon Blancs worked nicely as well. Experiment! --Tumbled oysters (a technique, not a type) have a firm texture and sweetness, closer to a scallop. Jacobsen calls the tumbling process like "pilates for oysters". What are your favorite wines to pair with oysters? Do you prefer Sauvignon Blanc, or something else? Let us know in the comments.